Omega-3 fatty acid deficiency is the sixth biggest killer of Americans and more deadly than excess trans fat intake according to a PLoS Med, 2009 study. Over the past 150 years, the western diet has changed so much that the ratio of omega-3 to omega-6 fatty acids has changed from 1:1 to 1:25 (and even up to 1:40) creating an overwhelming deficiency in omega-3 fatty acids and an excess of omega-6 fatty acids. This dietary imbalance may explain the rise of such diseases as asthma, autoimmunity, coronary heart disease, depression, neurodegenerative diseases and many forms of cancer, all of which are believed to stem from inflammation in the body. The imbalance between omega-3 and omega-6 fatty acids may also contribute to obesity, dyslexia, hyperactivity, and even a tendency toward violence. In 1850, we ate 40% omega-3 fats compared to 1970 where we ate 5% [Lancet]. The production of vegetable oils high in omega 6, such as sunflower, safflower and corn oils has soared, while animal feeds have switched from grass that contains omega-3 to grain resulting in higher levels of omega-6 in meat, eggs and dairy products. Omega-3 fatty acids include alpha-linolenic acid (ALA), eicosapentaenoic acid (EPA), and docosahexaenoic acid (DHA). These are essential nutrients and enter every cell membrane in the human body, lubricating cells, improving flexibility and communication between cells, and aiding cell metabolism and gene expression. DHA is highly concentrated in the brain and the outer segments of retinal rods and cones (eyes). EPA and DHA have powerful anti-inflammatory properties and promote healthy blood flow, which is essential to optimal brain function. Flaxseed oil, walnut oil and other nut or seed sources of omega-3 contains alpha-linolenic acid (ALA). Unfortunately, the body does not convert ALA into DHA and EPA very well. Omega-6 fatty acids include linoleic acid (safflower oil, sunflower oil, soybean, canola), arachidonic acid (peanut oil, factory-farmed, non-organic meat, eggs and dairy products) and gamma-linolenic, GLA (borage oil, black current seed oil and evening primrose). Omega-6 oils (corn, canola, soybean, sunflower, and safflower oils) are highly inflammatory. Cooking and heating these oils increase carcinogenic properties. Higher dietary omega-6 to omega 3 ratios are associated with worsening inflammation causing body chemistry changes that increases the risk of heart disease and interferes with nerve tissue functioning. When you eat excessive amounts of omega-6s (as is the case with today’s American diet), this promotes inflammation, blood clotting, constricts blood vessels and raises blood pressure. The key is to obtain a healthy balance between omega-6 and omega-3 fatty acids such as 2:1 – 1:1 ratio, which is optimal and ideal. Do You Need More Omega-3 Fatty Acids? Poor digestion and absorption. Antacids, antibiotics, NSAIDs and anti-inflammatory drugs, inadequate chewing, food sensitivities, infections (bacteria, viruses, parasites, fungal), gallbladder dysfunction, and alcohol consumption impair the absorption of fatty acids. Eating a plant-based diet can be healthy when it’s properly balanced with healthy fats and nutrients. However, the absence of all animal-based foods can take a toll over time causing several nutrient deficiencies such as carnitine, carnosine, taurine, vitamin B12 and omega-3 (DHA and EPA) that cannot be obtained from plants. A 1999 study of those with bipolar depression reported that supplementing with 10 grams/day of omega-3 fatty acids for 4 months significantly improved symptoms and increased the duration of remission. Those with higher levels of EPA and DHA have better moods and mental stability. “Omega-3s reduce symptoms of depression by 50%.” – Joseph Hibbeln, MD a psychiatrist at the National Institutes for Alcohol Abuse and Alcoholism. He also reported that violence in a British prison dropped by 37% after omega-3 oils and vitamins were added to the prisoners’ diets. 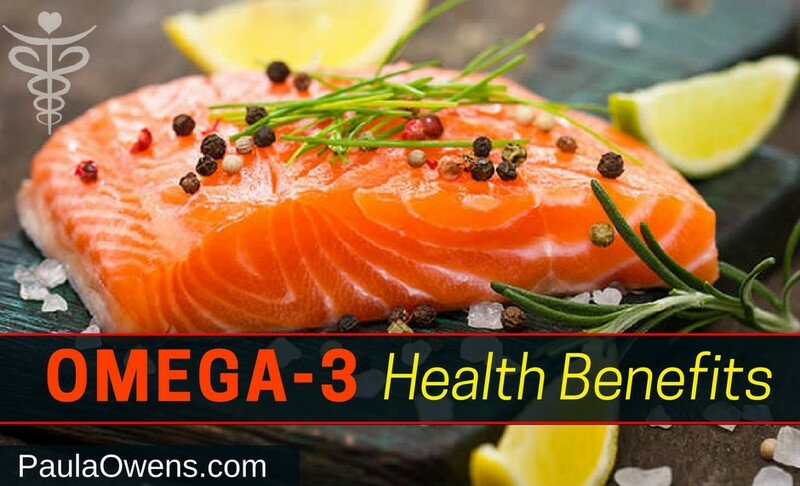 Omega-3s prevent irregular heartbeat, reduce arterial stiffness and fatty plaque inside the artery walls, improve endothelial function, decrease LDL cholesterol, increase HDL cholesterol, and lower triglycerides significantly reducing risk of sudden cardiac death. Fish oil reduces atherosclerotic plaque, makes the cell walls more pliable and lessens intracellular inflammation. 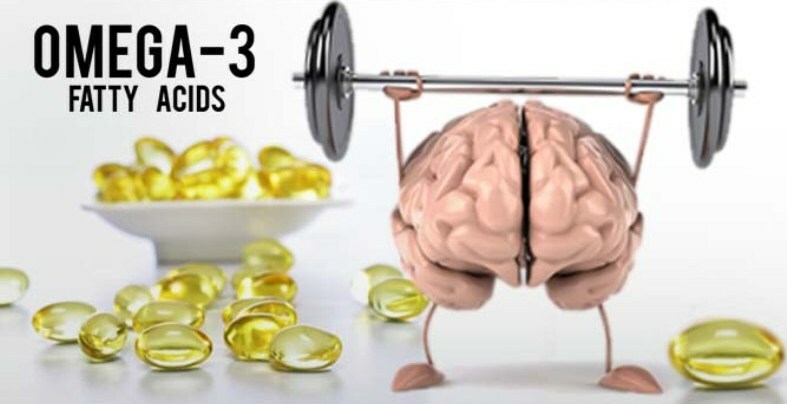 A study published in the journal Translational Stroke Research has determined that potent, anti-inflammatory compounds in fish oil and other sources of omega-3 fatty acids help to limit or prevent brain damage following a stroke. DHA present in fish oil provides protection for the delicate brain tissue that can become permanently damaged by blood clots or atherosclerosis. 1½ tablespoons of fish oil twice daily inhibits blood clotting and is much safer than the drug, Warafin according to Jonathan Wright, M.D. DHA improves memory by 3 years in older adults, and may reduce the risk for Alzheimer’s disease providing protection or delay for the onset of symptoms for those with APOE4 gene. DHA is the most abundant fatty acid in breast milk, a big reason mother’s milk is best for a newborn. Breast milk supplies the full range of EFAs needed for proper development of a child’s nervous system, brain and retina. Sadly, American women have the lowest levels of DHA in the world, and pregnancy depletes stores even more! The only lower percentage is among vegans. Maternal supplementation of DHA during gestation has neuroprotective effects against prenatal stress-induced brain dysfunction, hyperoxic injury and hypoxic ischemic injury. Pre-natal deficiency of omega 3 fatty acids increases the odds of diabetes in adulthood. An infant requires five-times more omega-3 fatty acids than an adult. A 2017 study in the journal PLOS One reported that supplementation with DHA was shown to stop the progression of nonalcoholic steatohepatitis (NASH, liver inflammation, oxidative stress and fibrosis) into more serious and life-threatening health problems such as cirrhosis or liver cancer. Helpful for constipation, colon health and inflammatory bowel conditions. A study published the journal Menopause that showed that omega-3 fish oils can significantly reduce the frequency of hot flashes. EFA deficiency is involved in most serious skin problems such as eczema, dermatitis, psoriasis, acne and hair loss. Both EPA and DHA help clear inflamed skin diseases like eczema and psoriasis. Transforms fat-storage cells into fat-burning cells, which may reduce weight gain in middle-aged individuals. Fish oil activates receptors in the digestive tract, fires the sympathetic nervous system, and induces storage cells to metabolize fat. Omega-3s stimulate muscle protein synthesis in older adults and may be useful for the prevention and treatment of sarcopenia and dynapenia. DHA found in fish has been shown to reduce the size of tumors and enhance the positive effects of the chemotherapy drug, cisplatin while limiting its harmful side effects. DHA reduces the accumulation of white blood cells, systemic inflammation and oxidative stress – all of which have been linked with tumor growth. The best food sources of omega-3 fatty acids: fatty fish (mackerel, wild salmon, tuna, cod, halibut, herring, anchovies and sardines), grass-fed, organic, pasture-raised meats, and eggs from chickens that are cage-free and pasture-raised on natural feeds rather than grains (especially corn). 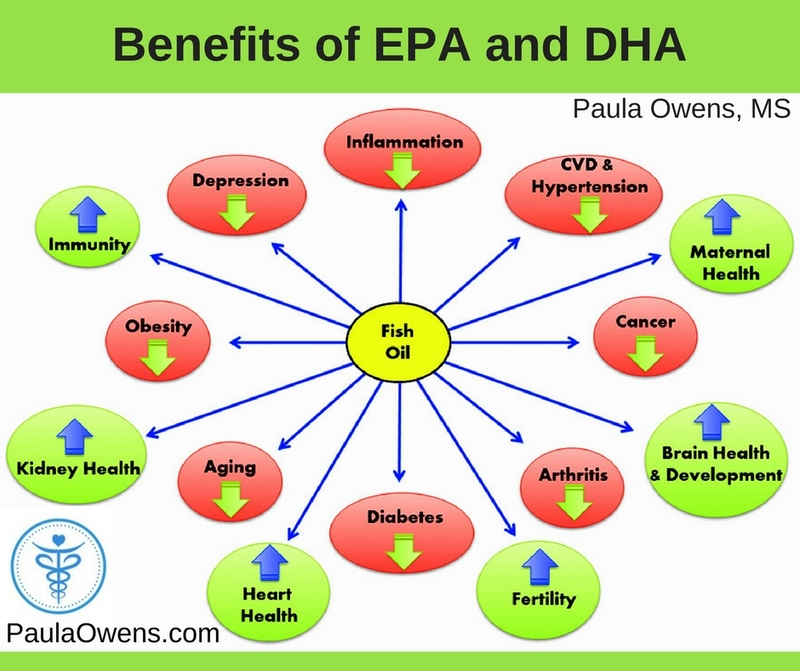 Since our body doesn’t make EPA and DHA, we must rely on food sources and supplementation. The most effective way to ensure that you are consuming the recommended amount of omega-3s is to take a high-quality, fish oil supplement. How much omega-3 to consider? The optimal fatty acid ratio/blend may differ from person to person depending on individual differences in absorption, biochemistry, genetics, age, health conditions and metabolism. Neuroscientist, psychiatrist and brain imaging expert, Dr. Daniel Amen recommends up to 3 grams of fish oil per day for most people and at least 2,000 IUs of vitamin D to boost brain power, mood and improve mental wellness. Quality matters when it comes to the fish oil that you purchase. Not all fish oil is created equal. Many common store shelf brands contain harmful environmental contaminants such as PCBs, heavy metals (mercury, lead, cadmium), pesticide residues, inflammatory genetically-modified soybean oil and other rancid oils. When supplementing with omega-3 fish oil, it’s important to know what type of fish was used and how it was concentrated. BioMega-1000 is a high-quality omega-3-fish oil. Fish oil is best taken after mealtime. If you consistently burp after taking fish oil, your body is not emulsifying the oils indicating digestive issues, gallbladder dysfunction or it’s a poor quality fish oil. The scientific evidence on the importance of omega-3s is strong and necessary for healthy aging, normal growth and development, prevention and treatment of depression, diabetes, cognitive disorders, traumatic brain injuries, cardiovascular disease, skin problems, cancer, obesity and many other health conditions. ★ Always consult with your health care provider, clinician or cardiologist before supplementing with fish oil if you take blood thinners, have a fish or shellfish allergy or a bleeding disorder. Read more about the benefits of omega-3s in my books, The Power of 4 and Fat Loss Revolution.